Raymond reports that The Beijing Organizing Committee of the Olympic Games (BOCOG) organized a gathering Tuesday night in the Great Hall of People in Beijing to greet and salute all the Chinese Olympians, and thank them for their great haul of medals in the Olympics. Click here for lots of photos from the event. The Chinese Basketball Association held a farewell dinner and party for the head coaches of the men (Jonas Kazlauskas of Lithuania) and women (Tom Maher of Australia) national team Monday evening in Beijing to thank them for their past years effort of leading the men and women national team for great results in the Olympics as their contracts are going to expire. 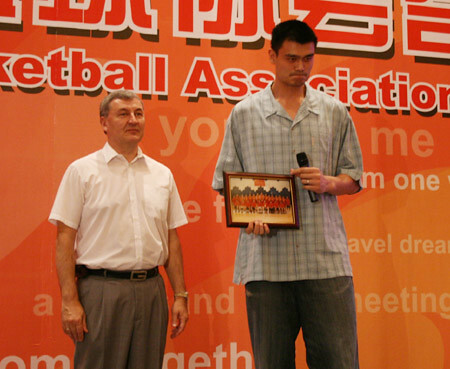 Yao Ming represented the men national team to speak on the occasion and presented a farewell gift to Kazlauskas. I want to introduce a new contributor to the Yao Ming Mania editorial team. Of course, you’ve known about Raymond in China for years, who has been extremely valuable to making the YMM community what it is today. Today I’d like to announce that Ren Hsieh of the Houston Chronicle’s ‘Yao Central’ blog will be posting here on YMM. I’ve always respected Ren’s observations, and like me, all of his writing has been a volunteer effort without any pay coming from it whatsoever. I recently asked Ren if he would want to join forces, and he thought it was a good idea, too. And proving how small of a world it is, although Ren now lives in New York, we both grew up in the same Houston suburb! It was meant to be. With that said, I’m not sure what will be in store for the site heading into the 2008-09 NBA season. We’re currently in the works to figure out a business model that can help sustain the site. Your donations in the past have been much appreciated, but we can’t expect donations to keep it running. But hopefully with the help of Team Yao, we’ll be able to work through it and make this upcoming season bigger and better than ever, thanks to contributions from Raymond and Ren. 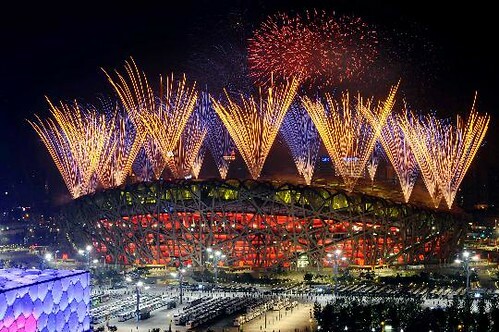 Watching the closing ceremonies last night really summed up nicely the entire 2008 Beijing Olympic experience. People from all over the world in one place relishing in a singular exultant moment, and then it was all over. Not without its tragedies, not without its share of controversy; but also not without its glory and extraordinary folklore, the Beijing Olympics comes suddenly to an end and now everyone must return to real life in the real world. And not, perhaps, without a sense of longing that the real world should be something like that. 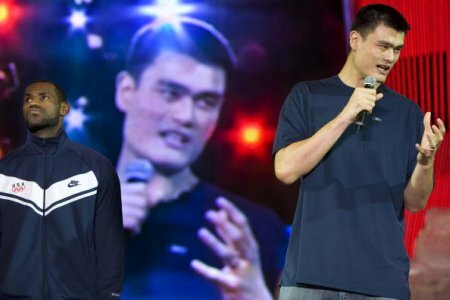 At the Closing Ceremonies on Sunday night in Beijing, Yao was surrounded by Olympic athletes wanting to get up close to him, including Australian basketball player and WNBA star Lauren Jackson. 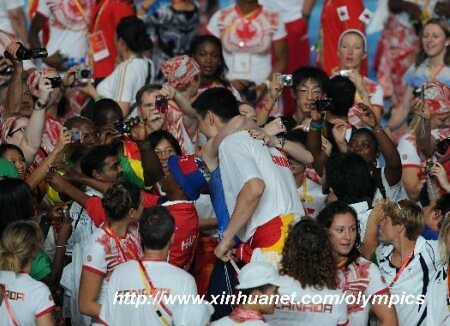 Here Yao is hugged by Jackson. Check out the photos from Yao Ming and Lebron James doing some marketing for Coke at an event in Beijing. Also, Raymond has an update on Yao’s schedule now that his Olympic competition is over. Raymond has done a great job translating this interview that Yao gave discussing his Olympic journey. China was thrashed in their elimination game with Lithuania 94-68 on Wednesday. The Chinese finished 8th in the Olympics, similar to how they finished in the 1996 and 2004 Games. 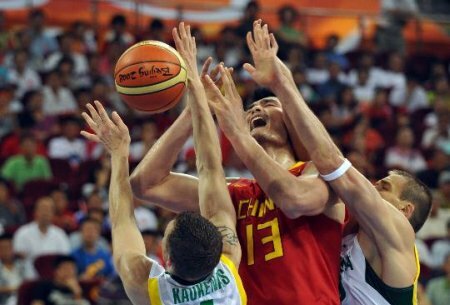 Yao Ming was double-teamed and hacked most of the game, but he still managed to score 19 points and grab 7 rebounds in the most action he’s had (33 1/2 minutes) during the entire Olympics. 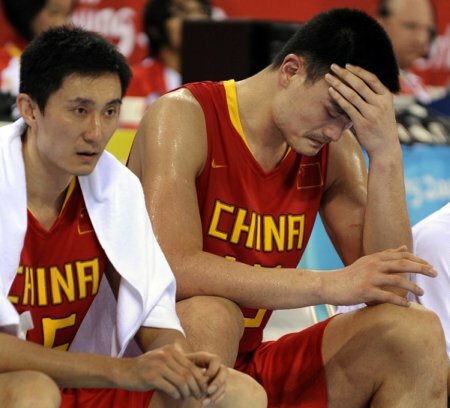 No one really thought the Chinese would contend for a medal, but it’s still a bummer to see them go out like this. 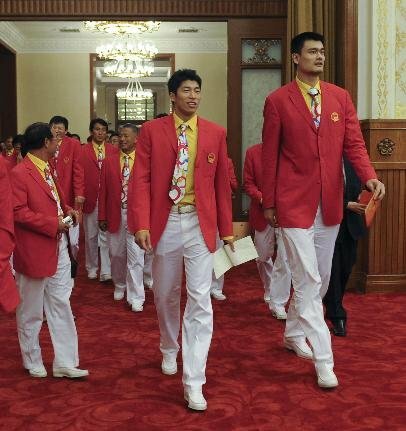 Now in question is Yao’s participation with the Chinese team leading up to the 2012 Olympics in London. Click here for the story on the game. 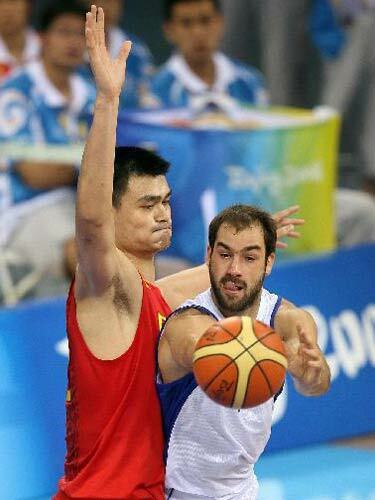 Monday’s game between China and Greece wasn’t even close, with the Chinese falling behind early and losing 91-77. With nothing at stake in the game since China is already advancing to the semifinals and the game out-of-hand so early, Yao Ming hardly played, scoring 16 points in 18 minutes of play. Vasillis Spanoulis, Yao’s former teammate for the Rockets pictured above, scored 19 points on 8-of-10 shooting. The Chinese next play Lithuania in a single elimination, do-or-die game. If they lose, their Olympics are over. Click here for the game story. Click here for the boxscore. Unbelievably, the much anticipated attempt by Chinese 110 meter hurdler Liu Xiang to repeat as a gold medal winner ended unexpectedly a short while ago because of a strained Achilles heel. Obviously, the Bird’s Nest is in shock. See the stories and photos here. You are currently browsing the archives for the 2008 Beijing Olympics category.